SBI PO Mains Admit Card 2019- The State Bank of India has declared that they will put the SBI PO Main Examination Admit Card on the official website of the recruitment board which is www.sbi.co.in very soon. All candidates who have already applied for the SBI PO Recruitment Exam can download the SBI Probationary Officer Mains Hall Ticket from the 2nd week of July onwards on the SBI Website. This will be because the examination is planned to be conducted on 20th July 2019. 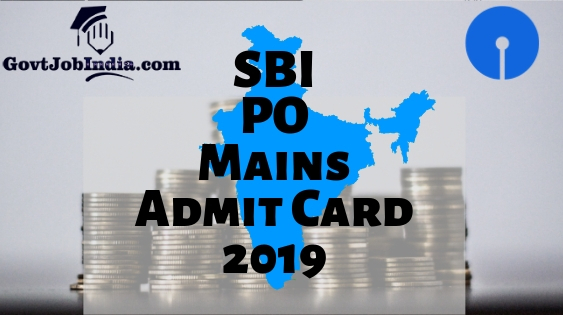 Links for SBI PO Mains Admit Card Download are provided on this page and candidates who have applied for the exam are requested to kindly use them for their SBI PO Main Exam Call Letter 2019. Are you tired of going through website after website in search of the SBI Hall Ticket 2019? Worry no more as you are finally on the right page. We have provided all the information you will need about the SBI PO Admit card 2019. Moreover, we have also provided direct links to download the SBI Probationary Officer Hall ticket 2019. So make sure you check this page before the second week of July 2-10 for the official SBI Probationary Officer Hall Ticket Download link. Also provided below are links to the regarding the SBI Exam Details and the SBI Exam Pattern. Kindly have a glance at it. Also, do not forget to visit the official GovtJobIndia SBI PO Recruitment Notification 2019 page for detailed information regarding SBI Probationary Officer recruitment. So, now that you have gone through the entire introduction, let us move onto the SBI PO Mains Admit Card details. If you are having any trouble in downloading the SBI Mains Admit card for PO then we would like to assist you in this matter. The SBI PO Mains Hall ticket Download process is very simple. If you want to download the SBI Exam Admit card the simply follow the steps we have enlisted below. If you have any other queries then kindly forward them to us in the comment section below. Visit the official portal of State Bank Of India, i.e. https://sbi.co.in/ Find the relevant link for SBI PO Admit Card download on the home page. Enter your Enrollment Number and Date of Birth at the time of Login. Verify the data you filled and click the Submit Button. This will lead you to a new page displaying the SBI PO 2019 Mains Admit Card. Take a print out of SBI PO Mains 2019 Hall Ticket and preserve it for further use. Just like that, you have downloaded the SBI PO Main Exam Call Letter. As easy as that. The State Bank of India has decided that they will conduct the official SBI PROBATIONARY OFFICER Exam on 20th July 2019. Should there be any changes in this date then we will update it on this page immediately. Since the dates have been pre-decided, you can now check the states and cities where the examination will be conducted. Furthermore, the SBI PO Call letter will contain printed information regarding the candidate’s enrollment number, exam seat number, exam venue etc. Candidates are urged that they pay close attention to details printed on the SBI Hall ticket to ensure there are no spelling mistakes or other errors. If any errors prevail, do not hesitate to inform the authorities at the State Bank of India. The State Bank of India PO Mains Hall Ticket is expected to have the following information printed on it. The most important document for the SBI PO Main Exam 2019 is the SBI hall ticket. Without the SBI Admit card candidates will not be allowed to attend their PO exam. So please do not forget to carry your Exam Admit card no matter which exam it is. Along with the SBI Call Letter candidates are also required to carry along with them a valid proof of identity. The identity proof is necessary in order to ensure that the applicant is genuine. So please carry your valid identification proof for the SBI PO Exam. You can carry one of the following documents. We hope that all the information provided here regarding the SBI PO Admit Card 2019 has been of help to you. We personally wish you all the best for you SBI PO 2019 exam and hope for the very best of success for you in your career. If you found the information provided here to your liking then support us by sharing this article to your friends or other individuals who are also applying for SBI Recruitment 2019. Also, subscribe to our website @ GovtJobIndia.com and bookmark us on your favourite website for the latest details regarding government jobs from all over the country.